Beginning with a precise definition of outsourcing, " Outsourcing is the act of transferring some of an organization's recurring internal activities and decision rights to outside providers, as set forth in a contract", this book deserves some attention from those wishing to take a major step in this area. 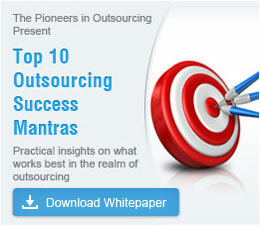 It presents a very lucid methodology for outsourcing. The concepts outlined are easy to follow, and though one may not find incredibly detailed information about each topic, the book will definitely serve as a reference to anyone needing a structured general approach to outsourcing. Those who have got their feet wet will vouch for the fact that outsourcing can be a complex, controversial and sometimes painful practice. "Strategic outsourcing" defines the correct approach and implementation for outsourcing, and something as important as the setting up- how to proceed and handle issues, once it is in place. Besides, one major difference between this book and the many others on this subject, is that it tries to be all-embracing, providing business examples from varied fields, unlike others which are IT-centric. "Like marriage, outsourcing is much easier to consummate than it is to terminate, and recover from, if done poorly", says Maurice F. Greaver II, stressing on the importance of a good beginning. He quotes British philosopher Alfred North Whitehead saying " Seek simplicity and distrust it", in other words, it takes time to implement an outsourcing initiative and longer to do it right. At the outset, he illustrates a case of a failed outsourcing project, where the customer finds himself stuck in a messy situation when he wants to reiterate the contract due to technical issues and malfunctions. According to the author, outsourcing is not a thing to be ashamed of. Historically, outsourcing was used when an organization could not perform due to incompetence, lack of capacity, financial pressures or technical failures. But now outsourcing is not the solace of a dysfunctional company, but is being practiced to restructure successful organizations. The step-by-step guidance, offered by the author is especially helpful to the project team as they proceed with the initiative. He offers many tips that only a wealth of experience could have created. The book is divided into eight parts, the first of which outlines an overview and the methodology. The remaining seven parts cover the seven identified steps that are closely interwoven into this delicate mesh of outsourcing. "As with any significant new initiative, planning activities, including project management issues, are important." "If the competencies are fleeting, easily imitated, or belong to a few individuals who could leave, then they are probably not core." "Without a full-time relationship manager, the organization may not be sufficiently engaged in the relationship, in monitoring and evaluating performance, and in addressing issues." "One of the greatest opportunities to reduce costs comes not through outsourcing the activities, but by driving the related overhead out of the organization." "On the surface, it might appear that all of the costs to "make" a product or provide a service would disappear with outsourcing, but they typically do not." "The final objective is to get five to seven proposals from the most qualified, interested, and cost-competitive providers, and to evaluate those proposals efficiently." "Before making the final cut, the project team should first have each provider confirm their proposal, so that it is no longer subject to due diligence." "When the contract is drafted, key elements of the proposal could be incorporated by reference so the proposal's commitments don't get lost in the legalese." "Think of the negotiating process as a funnel in which the issues are placed in the top, and slowly, through analysis and discussions, the issues are addressed and agreement is reached at the bottom." "While the relationship manager and the team have worked closely with the provider to review the transition plan, get the appropriate input, and play their roles, the primary transition role belongs to the provider." "It takes time to manage the relationship." "To build the relationship effectively, the relationship manager and the organization should be active in monitoring and evaluating performance and in addressing issues." Outsource2india, a leading BPO service provider headquartered in Bangalore, follows a 5-stage outsourcing process to go beyond simply meeting stated expectations or saving costs for your company. We aim at understanding your business and forging an enduring relationship with you, to help you meet both your short-term and long-term business goals and to create value for your business. Outsource2india's Verdict on "Strategic Outsourcing"
The examples in each chapter are supported by a cornucopia of facts, figures, statistics, charts and graphs, which strengthen the author's arguments. Also equally attention grabbing, are the series of boxes throughout the text that go beyond traditional reasons for outsourcing to provide "Another Reason to Outsource". These broader reasons are mentioned, but beyond this, there is little discussion of the pros of outsourcing compared with other sorts of partnering arrangements. Appealing quotations from a wide cast of philosophers, politicians and business gurus make this book an interesting read. Yet, sometimes these very quotations can seem like a case of overkill, considering they are found on every page of the book. Written in 1999, Greaver's book may not be the mantra for today's world, but of course, the basic concepts and processes involved in outsourcing remain the same even in the present situation. Also, nowadays, offshoring is becoming synonymous with outsourcing and again, this book does not explore that area. There is no separate chapter or discussion regarding the painful hurdle of employee dissatisfaction with outsourcing and tips for a manager on how to handle this situation adroitly. The author, obviously being an unabashed outsourcing proponent is able to provide a comprehensive overview of an important business trend, but at the same time, almost omits going over the shortcomings of outsourcing, giving this aspect only the benefit of a short appendix. Other than these minor pitfalls, this book abounds with clear and concise concepts and is extremely well structured. It is very easy to get lost in the plethora of information and issues surrounding outsourcing; this book is a comprehensive and practical guide leading companies through this confounding maze. One of the distinctive bonuses of this book is the application of sound business principles and common sense to this admittedly sophisticated concept. Unlike many authors, Greaver swiftly disposes of the whys and gets straight to the hows. This book is a good source of information for every organization's senior management team or for anyone interested in contemporary business issues and solutions. Whatever it is that you are looking for to learn about outsourcing, this book will definitely brush up a few of your managerial skills, and even furnish you with a some quotations to include in your talks on outsourcing. Outsource2india delivers world-class solutions in a range of other services that include Call Center Services, Data Entry Services, Engineering Services, Software Development, Research and Analysis Services, Photo Editing Services, Creative Design and Web-analytics Services.